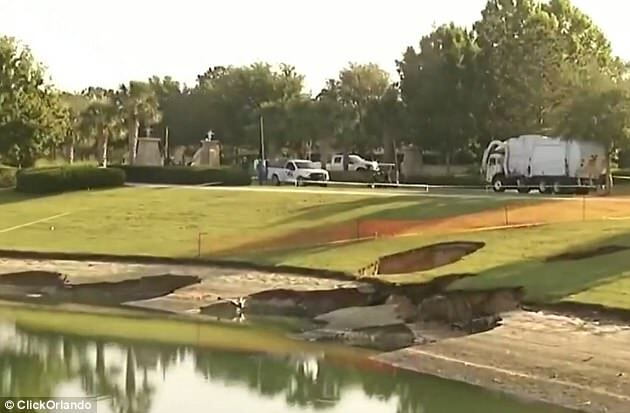 The sinkholes began appearing around pond in Wynchase, Ocala on the night of April 25, 2018, but have continued forming over the last two weeks. Now they are 12 huge craters… And they are moving closer to houses. Baffled engineers are carrying out tests (without any success yet) and the retention pond has now been drained. 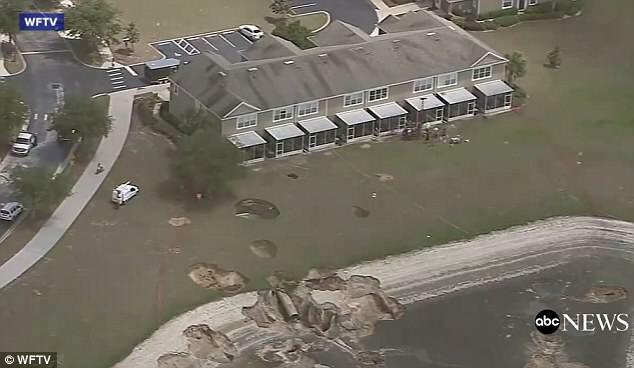 A dozen sinkholes have opened up in a Florida city, forcing eight homes to be evacuated and prompting fears from other residents they will be the next to leave. 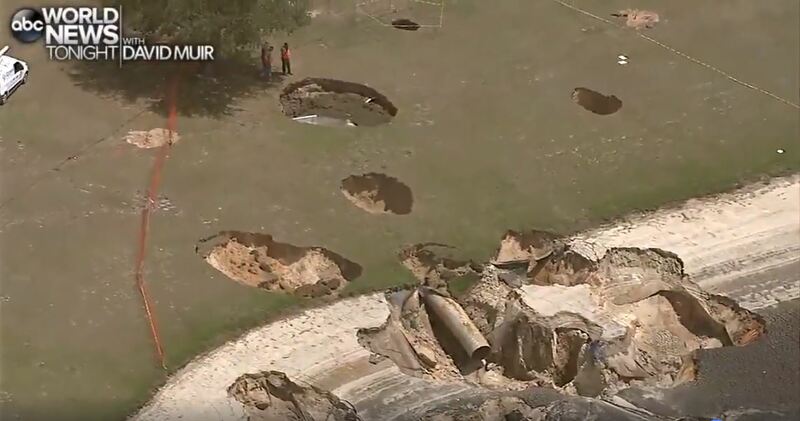 The holes began appearing around a retention pond in the Wynchase neighborhood of Ocala on the night of April 25, and have carried on caving in over the last two weeks for a currently unknown reason. The holes began appearing on the evening of April 25, and by the following day around eight could be seen. By this Tuesday there were 12, and they are beginning to move nearer to houses, according to local man Eddie Betaseourt. ‘It’s crazy, I got kids in the house and I want them to play in the backyard, but if a sinkhole opens up, they could get hurt or even disappear underground…‘ he told WCJB. 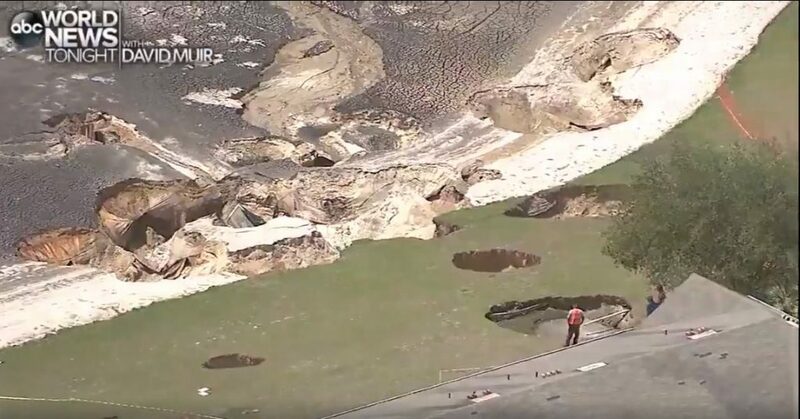 One video posted by the fire department last week showed a sinkhole close to the pond opening up and filling with water. The pond has now been drained and engineers are carrying out tests to understand what has caused the collapses. Richard Morang told the Click Orlando he heard strange ‘popping’ noises as the holes opened up, causing the tiles in his bathroom to crack. 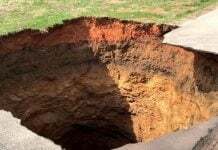 Sinkholes are caused by water flowing through channels below ground and eroding away soil or soft rock like limestone. And Ocala is no stranger to sinkholes, with the latest rash of them opening up in 2012. As the earth is carried into other parts of the ground large caverns can open up, usually unbeknownst to the authorities or the people living above them. Once the cavern cannot support the weight of the topsoil above it, it collapses into the ground. 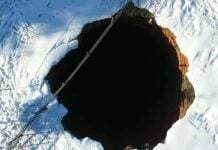 Sinkholes are depressions at the ground surface caused by the collapse of overlying chalk or superficial deposits into underground voids created by dissolution. And as shown in this map sinkhole-prone areas are widespread in the USA. Direct Radiation HAARP hitting the ground. I live in the central Florida area and this is no big deal. The sinkholes happen all the time especially over parts of Florida where there are limestone deposits, which is most of the center of the state. This is not Haarp or anything else…it’s natural. The reason we hear so much more of this is because they allow people to build their nice new homes over the limestone deposits. 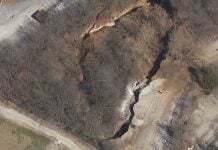 Most people who are not from here do not know this, so they never think to ask about sinkholes. So many people have moved here and built, you now hear of this all the time (at least every month or so). This is what happens when you build on karst and drain the aquifer.